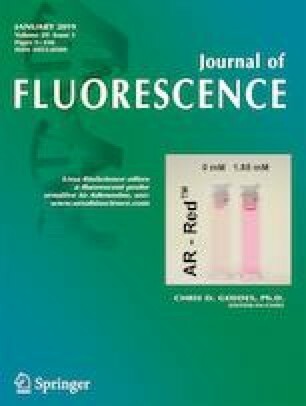 In this paper, the Au nanoplate with bright red fluorescence was synthesized on the basis of bovine serum albumin stabilized Au nanoclusters (BSA-Au NCs). The small molecule N-ethyl-N′-(dimethylaminopropyl) carbodiimide (EDC) was used as the cross-linking agent to activate the carboxyl group on the surface of BSA, and then the condensation with amino acid in BSA induced the self-assembly of BSA-Au NCs. The particle size of Au nanoplate increased with EDC concentration. In addition, when EDC concentration was 0.0050 M, the Au nanoplate changed from smooth to grainy structure. The Au nanoplate remained the unique fluorescence characteristics of BSA-Au NCs. As EDC concentration reached 0.0025 M, the Au nanoplate even exhibited brighter red emission than that of BSA-Au NCs. This work was supported by the National Natural Science Foundation of China (No.21076124 and No.51173104).